Uganda's Security Minister Wilson Muruli Mukasa has accused the opposition of using social media in a "grand plan" to topple the government. The directive was largely ignored with only two service providers implementing it, the BBC's Joshua Mmali in the capital, Kampala says. "They have adopted many tactics, including hoodwinking people to believe the agitation is in the public interest and the government is insensitive to public concerns," Mr Mukasa said. He said the opposition was using Twitter, Facebook and YouTube to wage a propaganda campaign against the security forces and to "psychologically prepare the people, especially young people, for armed insurrection". "If the consequences are that the government will be toppled, so be it. 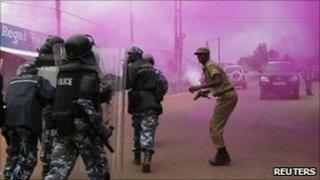 But that is not our aim," Mr Ogutu told the BBC's Focus on Africa programme. "There is nothing it can do. People will use social media," Mr Ogutu said. Mr Besigye said he would resume "walk-to-work" protests to highlight the rising cost of living in Uganda. At least nine people were killed in the government's clamp down on the protests.